Dust explosions represent a constant threat to much of the process industry. Practically any kind of flammable material, if divided into fine particles or powders and dispersed in air, can accelerate flames and cause explosion overpressures under the right circumstances. GexCon has a long track-record of experimental research into dust explosion mechanisms, and our DESC tool is the only dedicated CFD-simulator available to model dust explosions. The typical simulation project will be to study vent design for a scenario for which the guidelines of standards like NFPA-68 are not appropriate, either due to scale, geometry shape/layout, length of duct, or because only a fraction of the vessel can be filled with flammable dust. A dust explosion test laboratory was built at CMI (GexCon) in 1975 and in the decades to follow, a significant research effort was undertaken to understand dust explosions. A large-scale test site was constructed and experiments were performed in silos, filters and pipes to study flame acceleration and the efficiency of various methods used in explosion venting. In 2000, the DESC project was started by the European Commission, and coordinated by the UK HSL, to develop a dust explosion CFD-simulator. DESC was built around the GexCon CFD-tool FLACS, but adapted to dust explosions. 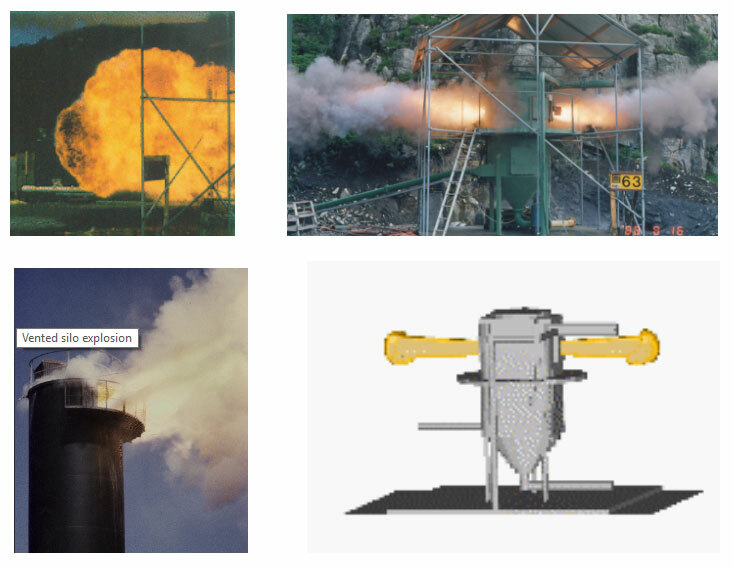 GexCon can simulate the development of a dust explosion with our DESC software, either to understand accidents that have taken place or to predict how best to protect equipment from dust explosion hazards. Simpler approaches, implemented in venting guidelines and standards, typically have limitations when considering long explosion ducts or multi-compartment flame propagation. Conversely, more realistic geometries can be implemented in CFD-simulations as well as more realistic assumptions on flammable cloud volumes (if this deviates from the vessel volume). Using GexCon's DESC simulator, GexCon can assist clients in developing strategies to prevent or mitigate dust explosions by conducting consequence safety studies of new or existing facilities, implementing methods to reduce explosion hazards, and designing testing programs to evaluate the hazards. Davis, S.G., Hinze, P.C., Hansen, O.R. & van Wingerden, K. (2011). Does your facility have a dust problem: Methods for evaluating dust explosion hazards. Journal of Loss Prevention in the Process Industries, 24: 837-846. Davis, S.G., Engel, D., and Hansen, O.R., Dust or Gas Explosion: Case Study of Dryer Explosion and Design Venting, Paper presented at AIChE Spring Meeting, 6th Global Conference on Process Safety, San Antonio, USA, March 22-24, 2010.
van Wingerden, K., Pedersen, G. and Davis, S.G., Application of a Short Cut Risk Analysis Methodology for Analyzing Dust Explosion Hazards, Paper presented at AIChE Spring Meeting, 6th Global Conference on Process Safety, San Antonio, USA, March 22-24, 2010.